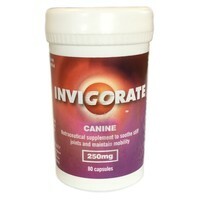 Invigorate Canine Capsules for Dogs is a dietary supplement designed to soothe stiff joints and maintain mobility. Each capsule contains a powdered, cold processed extract of Perna canaliculus (New Zealand Green Lipped Mussel), which also contains a range of novel Essential Fatty Acids of the Omega-3 series. Invigorate Canine offers a natural alternative choice in joint care and is most effective in cases of low-grade chronic joint stiffness, and should be considered as a first line option. Regular use of Invigorate Canine will enable a return to normal activity, such as standing up from a lying position or walking. I was advised by the vet to put my 9 1/2 year old Weimaraner on Invigorate as the cartilidge on her back legs was wearing thin. As I have a 12 1/2 Weimaraner as well I decided to put them both on it. Well it has certainly seemed to work with the eldest one. Whereas before he struggled to get up from his bed and he would lag behind on walks where he plodded along he is now much better and moving more easily. He now walks ahead of me and is walking/trotting on his toes. He is also given the VetUK joint supplement which seems to compliment the Invigorate. Definitely a recommendation for both. I started giving this to my 9 year old newfoundland who had lots of joint problems and seemed to be on her last legs (as it were). Other dog owners had recommended green lipped mussel supplements (though none in particular) so I decided to give it a try. And it really did seem to help. She perked up and is walking better (now at almost 10) and seems good for another year. Can't prove it was Invigorate but there was certainly a noticeable improvement after she started taking it and nothing else changed.